The “anthrax attacks” that followed on the heels of the “9/11 attacks” have receded into memory for most people, even including those of us who were extremely skeptical about alleged al-Qaeda biowarfare at the time. Prof. Graeme MacQueen, in his latest book, The 2001 Anthrax Deception: The Case for a Domestic Conspiracy,  sheds light on why most of us have all but forgotten the sensational “anthrax attacks.” They’ve been dropped down the memory hole as a touchstone to justify the “war on terror” because the “anthrax attacks” fraud fell apart. In his tight (just 214 pages) but definitive account, MacQueen proves beyond doubt that the “anthrax attacks” were a false flag operation. Those who need to be persuaded need look no further than this overdue book. The “anthrax attacks” were intended as a powerful evil twin of the 9/11 terror fraud. Taken together these ops were to be a one-two punch that would launch the “war on terror,” while simultaneously justifying the illegal invasions of Afghanistan and Iraq. The invasion of Afghanistan because allegedly Osama bin Laden directed 9/11 from a cave there. The invasion of Iraq because allegedly Iraq provided al-Qaeda with the anthrax. But the wheels fell off of the anthrax wagon. MacQueen tracks the twists and turns of the official narrative to show how that happened. … the documentary evidence […] when studied critically, raises serious questions not only about the FBI’s account of the anthrax attacks but also about the U.S. government’s account of what happened on September 11, 2001. Taken together, these sets of evidence erode the rationale for the Global War on Terror. The 2001 Anthrax Deception shows how academically-sound evidence, marshaled in plain language in a rational framework, can be a counterforce against any deception. And what a whack of deceptions MacQueen has to deal with. Take the intentions of the perpetrators, Cheney & Co. MacQueen invented the term the “Double Perpetrator hypothesis” to describe the intendedly clever deception. The Double Perpetrator hypothesis had advantages over the simple al-Qaeda hypothesis. Spreading anthrax through mailed letters was a primitive and ineffective means of dispersing anthrax if the goal was multiple casualties. This crudity was reinforced by the text of the letters, with their misspellings and unidiomatic English. In the Double Perpetrator hypothesis these primitive elements could be laid at the feet of al-Qaeda, while the source of the sophisticated B. anthracis spores in the envelopes to the senators had to be a state, Iraq, which was known to have once possessed a stockpile of anthrax. A peculiar paradox was thus resolved. Already in their surprisingly timely book, Germs: Biological Weapons and America’s Secret War, published in early October of 2001, Judith Miller and co-authors William Broad and Stephen Engelberg explained that Iraq might use a “surrogate, a terrorist group” to deliver a bioweapon to its target. It will not surprise anyone reading The 2001 Anthrax Deception who is knowledgeably critical of the grotesque output of mainstream media (MSM) on issues of war, peace and “intelligence” that much of MacQueen’s book, perhaps a third of it, is devoted to MSM lies and propaganda. Without the almost blanket collusion of “news” outlets, the likes of Bush and Cheney would have been revealed as pathetic emperors with no clothing. This in turn cleared the way for the Plan B “lone wolf” theory, the eventual frame-up of Bruce Ivins, his almost-certainly-not “suicide” and the subsequent dispatch down the memory hole of the entire botched “anthrax attacks” illusion. It turned out not to be much of a loss for the Machiavellian perps, however, because Cheney & Co. could go head and launch war on Afghanistan and Iraq as they intended all along without the aid of this substance-abusing false flag op. The monster 9/11 deception was alone enough to do the heavy lifting there. The general brainwashing was easily accomplished through a surplus of media-megaphoned lies, propaganda and spin. These greased the skids for the illegal and bloody aggressions of the USA and its “allies,” including in the case of Afghanistan, Canada. Perhaps my favourite chapter is eight, in which the author traces the origin and uses of the term “the unthinkable.” Numerous quotes from establishment figures and media pundits show that their use of the term serves radical right wing ideological fear-mongering purposes. Part of chapter eight is devoted to a “simple word study” of the language of the infamous document entitled Rebuilding America’s Defenses, released in the year 2000 by the extreme pro-military right wing Project for the New American Century. MacQueen notes that although the term “security” occurs 94 times in the document, the term “Security Council” does not occur at all. Nor does the term “international law.” Keyword counts count, even when they’re zero. MacQueen’s admirable critique of language leads me to a shortcoming, in my estimation, of The 2001 Anthrax Deception. This may be minor compared to the book’s strengths, but still is worth mentioning. The author should in my view have drawn more attention throughout the text to the multitudinous and ongoing abuses of language by the perpetrators and the MSM, particularly their abuse of the word “attack” (as applied to 9/11 or the anthrax situation). Any conceivable attack – the word clearly denotes an assault from outside – is severely at odds with “a domestic conspiracy,” as the book’s title has it. The conspiracy of this book unmistakably is an inside phenomenon. A feigned attack should never be called “an attack.” Period. The alleged hijackers of four planes on September 11, 2001 play an important role in the anthrax story and will be mentioned frequently. To avoid repeated use of the word “alleged” or annoyingly frequent scare quotes (“the hijackers’” I will capitalize the term: Hijackers. This to me is an odd way to downplay the reality that the alleged hijackers never boarded any of the planes, as Elias Davidsson painstakingly proves in his book Hijacking America’s Mind on 9/11: Counterfeiting Evidence. In other words, for a book such as The 2001 Anthrax Deception: The Case for a Domestic Conspiracy to be as effective a counterforce against deception as it can be, the language bombs of the perpetrators must be defused before they can explode. Each. And. Every. One. Even within the pages of a dissenting academic activist’s book such as MacQueen’s. The tools of word bomb dismantling include, besides a robust disquisition on the power of language, a plethora of synonyms such as alleged, supposed, claimed, asserted, made out to be, so-called, professed, purported, ostensible, putative, unproven, charged, declared, stated, contended, argued, maintained – and this is not a complete list. Deployment of the many synonyms available plus quote marks would not, to me, be “annoyingly frequent” but rather refreshingly combative. They necessarily and importantly must be repeated. This is standard operating procedure required when de-fusing word bombs. Notwithstanding my rant about language use, I fervently hope for more books from Graeme MacQueen. The world needs his assiduous research skills, his courageous tackling of the really big deceptions, his astute analyses and his clear thinking and writing. (Obviously, I don’t mean to attack him. A pro-Palestinian Italian activist was shot and seriously wounded by Israeli gunfire during a Friday protest in the northern West Bank, medics and the activist’s organization said. Palestinian security sources said Patrick Corsi, a 30-year-old member of the International Solidarity Movement (ISM), was shot during the weekly demonstration at Kafr Qaddum, west of Nablus. Eyewitnesses said Corsi, who had participated in last week’s protest as well, had been documenting the event with a camera. ISM, an activist group whose members frequently attend Palestinian protests to monitor the actions of Israeli soldiers, confirmed the shooting in a statement. “The Italian activist, known as Patrick, was wearing a yellow high visibility jacket when he was shot with .22 live ammunition,” the statement said. The statement added that 10 Palestinian protesters were wounded by rubber-coated steel bullets at the protest, in addition to 18-year-old Sami Jumma who was struck by live fire. Khaldoun Ishtewi, media coordinator for public campaigns in Kafr Qaddum, told Ma’an news agency that the Italian national was taken to the Rafidia Public Hospital in Nablus for treatment. An Israeli army spokesman described the event as a “riot” during which 100 Palestinians allegedly hurled rocks at troops and burnt tires. After failing to disperse people and “due to increased violence,” soldiers “fired small caliber rounds toward main masked instigators,” the spokesman said. In the West Bank at the Qalandiya crossing between Jerusalem and Ramallah, Israeli border policemen “fired small caliber rounds toward two main instigators’ lower extremities” during a violent clash with some 150 Palestinians, the spokesman said. The West Bank and annexed East Jerusalem have been occupied by the Israeli military since 1967. The report, released today by the UN Committee Against Torture, said that the practice “constitutes ill-treatment”, and called on the US to halt it. The Committee also noted that “detainees’ lawyers have argued in court that force feedings are allegedly administered in an unnecessarily brutal and painful manner” – an apparent reference to US litigation brought by international human rights NGO Reprieve on behalf of cleared Syrian detainee Abu Wa’el Dhiab. As part of those legal proceedings, the Obama Administration has until Tuesday, December 2nd to appeal a recent court order to release over ten hours of classified footage showing the force-feeding of Mr Dhiab. Further detail on Reprieve’s force-feeding litigation can be found at the Reprieve US website. All in all, the ideas that come out of the Brookings Institute are discussed at the highest levels within policy-making and corporate circles. The Brookings Institute in its proposal for an invasion of Syria claims: “The Saudi offer to provide facilities to train 10,000 Syrian opposition fighters is one of reasonable possibility, although one of Syria’s neighbors would probably be preferable. Jordan already serves as a training ground for America’s current training program and it would be an ideal locale to build a real Syrian army. However, Turkey could also conceivably serve that purpose if the Turks were willing” (p.10). In mid-November, the Pentagon also presented a proposal to the US Congress, saying that it wants to arm Iraqi tribesmen with Kalashnikov rifles, rocket propelled grenades, and mortars. What is omitted is the cross-border dispersion of these tribes in both Iraq and Syria and the possibility that these weapons could be used in an attack on the Syrian government. The U.S. government has signed a US$1.4-million-contract with a public relations company to produce “TV and radio programs designed specifically for audiences in Cuba,” according to the Office of Cuba Broadcasting’s press release that Tracey Eaton cited in her blog Along the Malecon. The Office of Cuba Broadcasting (OCB), funded by the U.S. government through the presidentially appointed Broadcasting Board of Governors, runs Radio and Television Marti and has its headquarters in Miami, Florida. In 2006, The New York Times revealed that OCB paid 10 journalists to work for Radio and TV Marti. The Miami Herald fired three of the journalists from El Nuevo Herald after learning they were receiving money from the Bush Administration. The OCB’s interventions in Cuba have found their echo in more recent attempts by the U.S to use modern media to destabilize Cuba’s socialist system. A scandal broke out in April when the U.S. was found to be engaged in “battle” with Cuba on the social media front. This latest onslaught was carried out under the guise of ZunZuneo, a social media platform targeted to Cuban users. ZunZuneo, set up with the help of high-tech contracting firms from Nicaragua and Costa Rica, eventually reached over 40,000 Cubans. The contractors, together with USAID, set up an equally elaborate scheme of front companies using Cayman Islands bank accounts to hide the venture from the Cuban government. New executive recruits were also not told about ZunZuneo’s ties to the U.S. government. The Guardian’s headline for the video was “Syrian boy ‘saves girl from army sniper’” and the Telegraph delicately suggested the Syrian military was responsible for the fake bullets. The International Business Times stated, “the snipers, who reportedly are said to be the government forces loyal to Syrian President Bashar al-Assad.” IB Times never explicitly mentioned who reported this information. They then took it a step further and concluded the article with “the incident certainly is not the first time that Pro-Assad gunmen have targeted children”. Well it is at least not the first time the mainstream media has presented false reports as fact. In 2012, CNN claimed a bullet that killed a four year old girl in Aleppo was shot by government snipers even whilst admitting the bullet came from rebel held buildings. Other journalists took to Twitter to make unfounded claims about army snipers targeting the boy. Vinnie O’Dowd who has done work for Channel 4 and Al Jazeera tweeted “Syrian Regime Targets kids”. 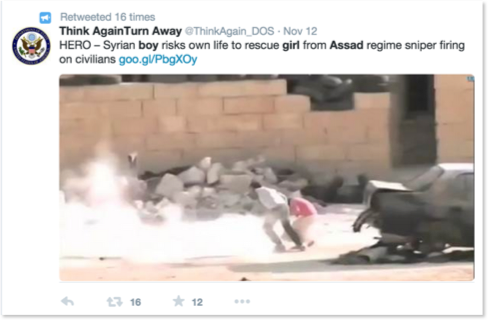 Liz Sly of the Washington Post tweeted incredulously that “Soldiers kept shooting” at children. This is very strange since both children in the film walk away after being directly and repeatedly hit by bullets. The creators of the film said he purposely scripted this as a big hint that the video is fake. The lack of scrutiny the media experts employed suggests incompetence or the same level of bias as the media that employs them. However many viewers who aren’t referred to as video or Middle East experts, immediately recognised the video was a fraud and flooded social media sites Twitter and Youtube with doubts on its authenticity. If Heather Saul had used these individuals as experts rather than HRW, she would have reached the correct conclusion about the video. But perhaps it is this unbiased eye that the mainstream media avoids. The vast majority of Higgin’s conclusions support US government narratives and agendas, and that’s the kind of bias the mainstream media prefers. The experts that were fooled by the video also strongly protested. HRW posted a complaint that the fake video “eroded the public trust in war reporting”, in other words blind trust in HRW analysis and war propaganda. Eliot Higgins posted an open letter to the producer of the film on his website Bellingcat, condemning the film. GlobalPost referred to the film as ‘irresponsible and dangerous’ but not because it could be used to promote wars and make false accusations. What the real danger to the mainstream media and their experts seems to be, is that as a result of the film’s exposure as a fraud, future video claims may now have to be properly scrutinized and the public may not be so unquestioning in future. However it is the journalists’ lack of scrutiny that is truly what is irresponsible and dangerous. Had the director not admitted the film was fake, these journalists more than likely would have kept promoting the story as an example of Syrian Army war crimes. The reason why Tony Blair can be given a global legacy award, despite his crimes, comes down to the level of awareness of the British public. Save the Children gave Tony Blair, a man who contributed massively to the deaths of hundreds of thousands of Iraqis during the decade he was the UK Prime Minister, a “global legacy award.” How can this charity get away with doing something so monstrous? The reason is simple. The vast majority of the UK public do not have a clue about the consequences of the war Blair and his superiors in the USA launched in 2003. As of May 2013, a professionally done poll found that 59% of the UK public believed fewer than 10,000 Iraqis died as consequence of the war. The UK media buried this ComRes poll (they routinely mention other polls done by ComRes) as effectively as they buried the death toll in Iraq. Very similar polls done years earlier in the USA found an equivalent level of ignorance. Little wonder that Save the Children can openly honor a mass murderer. Scientific studies support estimates of 500,000 – 1 million Iraqi deaths as a result of the war Blair played such a key role in bringing about. Only 6% of the respondents in the ComRes poll estimated more than 500,000 Iraqi deaths. Before the illegal war was launched in 2003, US/UK policy was one of crippling sanctions (enforced by the UN) combined with airstrikes. Two of the UN officials (Denis Halliday and Hans Von Sponeck) who ran the oil-for-food program in Iraq resigned in disgust at the barbarism of policies they claimed (citing UNICEF statistics) killed hundreds of thousands of Iraqi children during the 1990s. The best available evidence shows that US/UK actions over the past 24 years have killed between 1-2 million Iraqis, hundreds of thousands of them children. Blair aggressively backed the war and the sanctions during the decade he was in power. It’s therefore beyond any reasonable doubt that hundreds of thousands of Iraqi children were killed, orphaned or otherwise traumatized for life because of crimes he perpetrated. The UK public just doesn’t know about it. Even Russell Brand, in what is, overall, quite a fine book (“Revolution”), neglected to mention the human cost of war in Iraq in Chapter 17 where he devotes attention to the fraudulent pretexts for it. The blog also points out that in 2013 the wife of the current UK Prime Minster was appointed Save the Children’s Ambassador to Syria – where the UK continues to help fuel the civil war by arming and funding rebels. Some may argue that charities cannot afford to denounce people in high places. But what Save the Children is doing by honoring Blair (not simply keeping quiet about him) is enthusiastically contributing to a propaganda system that keeps millions of the West’s victims invisible. Save the Children is helping to ensure that Blair’s successors are well positioned to do similar damage to innocent people around the world. That’s worth repeating. The key service charities must provide to keep going is to make their donors feel good. That’s horrible enough, but it gets worse when you consider who their key donors are. In the USA, studies have shown that the poorest 20% of the population gives about 4% of their meager incomes to charities while the richest 20% give only about 2% of their huge incomes. However, the richest 20% today have roughly sixteen times more income than the poorest 20%. That means charities get roughly eight times more money from the richest 20% despite that group’s lack of generosity. None of the middle income groups gave more than 3% of their incomes to charities in the study I cited above which is from 2007. That means the richest 20% give more money to charities than the poorest 60% of the population. See the table below. The worse inequality gets, the more heavily charities depend on the rich; the more charities must make elite donors feel good about themselves and also feel good about war criminals like Tony Blair who stuff their pockets. A rights group says many civilians have been targeted and killed in US drone attacks in Pakistan and other countries where such raids are carried out, Press TV reports. The UK-based rights group Reprieve revealed that civilians have been killed in Pakistan and other places before militants were targeted by US assassination drones. Reprieve has presented several cases on how ruthlessly the US Central Intelligence Agency (CIA) has killed civilians but declared them militants through dubious reports in the media, which regularly cite anonymous Pakistani and US officials. In one such case, the CIA killed 221 people, including over 100 children, in Pakistan in search of just four militants. This is while three of the militants are reportedly still alive and the fourth one has died of natural causes. In another example, the report pointed out that on average each militant was targeted and reported killed more than three times before they were actually killed. To kill one militant, sometimes “more than 300 people have been killed,” said Mirza Shazad Akbar, Reprieve’s representative in Pakistan. “A former US drone operator said that by looking at the monitor and looking at people’s movement, he could actually tell who is a bad person and who is a good person… This is the extent of… the [US] flawed intelligence,” Akbar added. But this is just the tip of the iceberg of the scale of tragedy in Pakistan’s tribal areas, where more than 3,800 people have been killed with the same pattern of the so-called precise surgical drone strikes. The United Nations and several human rights organizations have identified the US as the world’s number-one user of “targeted killings,” largely due to its drone attacks in Pakistan and Afghanistan.